SAWPA has been working in conjunction with its partners, primarily the Santa Ana Watershed Association (SAWA) and Riverside County Regional Park and Open-Space District (RivCo Parks), toward the goal of eliminating invasive cane, Arundo donax (Arundo) from the Santa Ana River Watershed. Thus far, 3,000 acres of Arundo was removed and replaced with native habitat, providing approximately 10,000 acre feet per year of new water to the region (enough water to support 20,000 families per year). 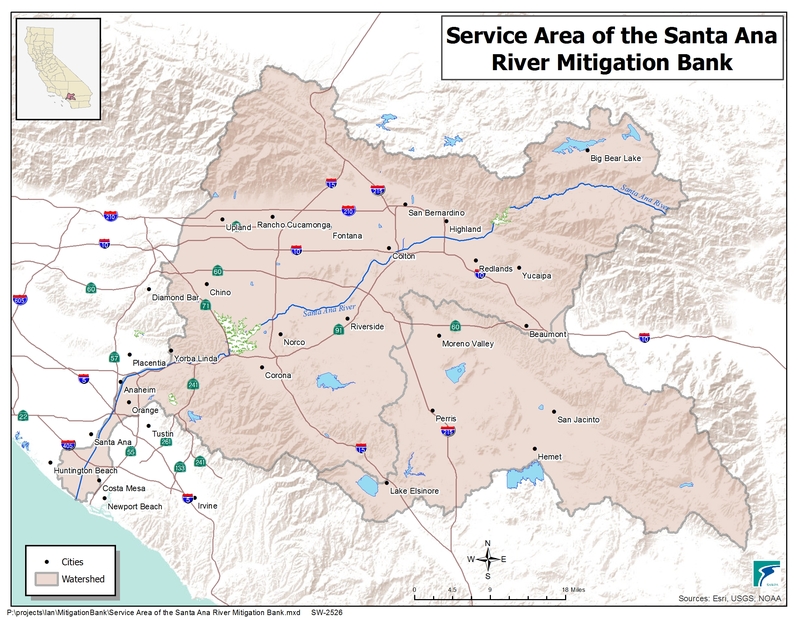 RivCo Parks administers the Santa Ana River Mitigation Bank. The bank allows for project proponents or developers who have mitigation needs to purchase credits in lieu of implementing mitigation themselves. The sale of SAWPA owned credits goes toward the removal and treatment of Arundo and other heavy water using invasive plants in the Santa Ana River Watershed per SAWPA Commission Resolution 427. Do you have a project or development that is within the Santa Ana River Watershed and near a waterway? Then the Santa Ana River Mitigation Bank may be a perfect mitigation credit source for you. These mitigation credits are available through SAWPA and the Riverside County Regional Park and Open-Space District. The minimum purchase is ¼ acre. Acreage credit is available on a first-come-first-served basis. To initiate the purchase of mitigation credits, please submit an email to Ian Achimore at iachimore@sawpa.org and the Riverside County Parks Finance Office at Parks-Finance@rivcoparks.org . A memo will be prepared for you upon receipt of the email. Do you have a project or development that is within the Santa Ana River Watershed and near a waterway? This may be a perfect mitigation credit source for you. THINK NATIVE IN SOUTHERN CALIFORNIA AND STOP GROWING ARUNDO! WHY SOUTHERN CALIFORNIANS SHOULD STOP PLANTING AND START GETTING RID OF ARUNDO DONAX.